In addition to writing about pets, I have the pleasure of working as a dog walker and pet sitter. Among my clients is Spring, who was adopted from Greyhound Friends of New Jersey (GFNJ), and is a graduate of the group’s Prison Foster Program. 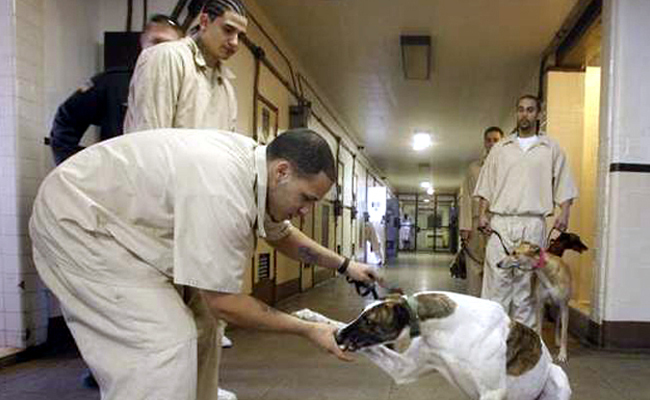 This wonderful program that is located at the Mountainside Youth Correctional Facility in Annandale, NJ, celebrated its 15th year anniversary in May 2017 and to date has graduated approximately 822 greyhounds. 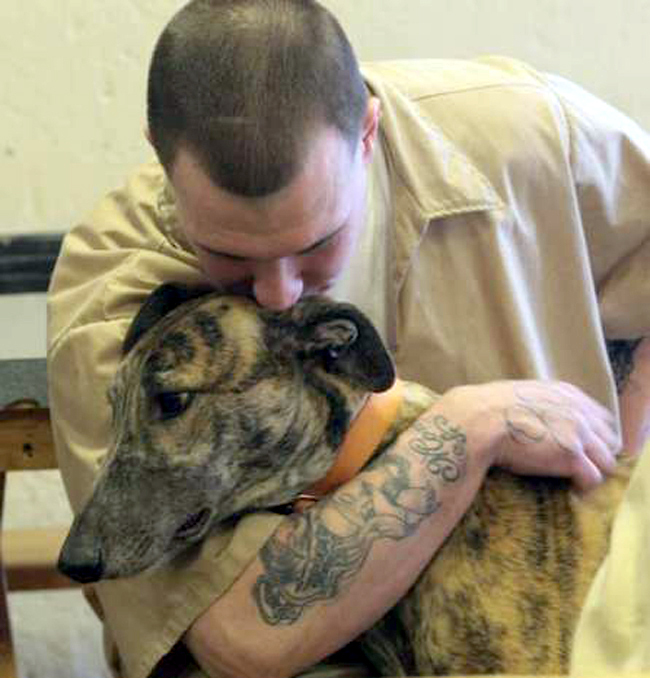 In 2011, GFNJ was inducted into the New Jersey Animal Hall of Fame for the positive impact the Prison Foster Program has had on the retired racing greyhounds and the participating inmates. The foster program started with just three dogs and can now accommodate up to 15. Through trusting and building an open relationship the rescue group, the prison superintendent and the corrections commissioner joined forces to launch the program, wrote GFNJ president Linda Lyman in the group’s Spring/Summer 2017 Home Stretch Newsletter. The foster program presented an opportunity to prison staff and inmates to provide care and training to dogs waiting for forever homes while improving the inmates’ lives as they prepared for their futures. Thanks to the experience gained in the program, some inmates have gone on to pursue careers with animals—for example, working as veterinary technicians or kennel assistants. As many as 30 inmates are enrolled in the foster program with each dog assigned to two handlers. The other participants work their way up to the role of handlers by assisting with such tasks as cleaning the kennels and outdoor runs or assisting with the bathing of the dogs. Participants are chosen based on recommendations of the corrections officers and following interviews with Smith. Dogs sleep in the cells with inmates at night and during the day they are either in training classes or relaxing in outdoor runs. Working with the dogs has a calming effect on the inmates and teaches them responsibility and self-control, Smith said. Smith’s greyhound, Bitel, is a graduate of the foster program and she often takes him back to visit the prison. The prison program has been especially helpful in rehabilitating broken-legged dogs who require controlled leash walking once they are out of their casts. It’s also a terrific placement for special needs dogs who require extra care. For example, Hannity, rescued from the track in Florida with severe dry eye, needs three different drops placed in his eyes three times a day. Most of the greyhounds rescued by GFNJ are off the track in Florida with a few coming from breeding kennels. Aside from maybe an overnight in a staging kennel, the dogs are almost immediately placed with a foster family or into the prison program. All foster families—including the inmates—are asked to teach the dogs to sleep in their own beds because many potential adopters don’t want dogs on their furniture. Because of the special bond that develops between inmates and their dogs, this rule is not strictly enforced in the prison. The GFNJ rescue group is always in need of financial donations and supplies to help support the Prison Foster Program.